High fiber foods gives a person a feeling of fullness without adding too many calories to the diet. Fiber is present mainly in plant leaves, skins, roots, and seeds. Processing and refining foods removes almost all of their natural fiber. 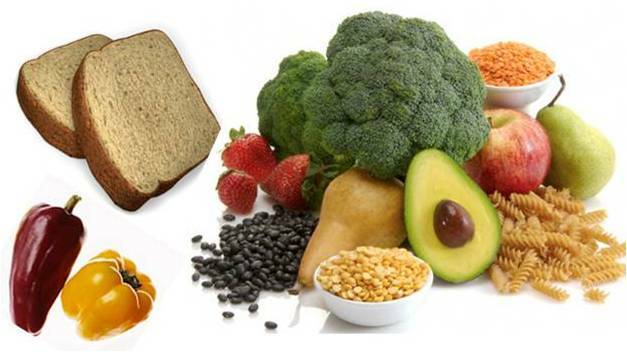 In our diet, the main sources of fiber are whole-grain cereals and breads, fruits, vegetables, and legumes. Fiber is a special type of carbohydrate that passes through the human digestive system, virtually unchanged, without being broken down like other nutrients. Since your body cannot really digest or absorb it, it is not nourished by it. This nutrient is vital for good health; it helps reduce your risk of heart disease. It is good for the digestive tract and overall health. As a bonus, eating lots of this nutrient helps you feel full on fewer calories, which makes it ideal if you are on a weight loss program. As you can see, many fiber foods have both the soluble and insoluble types. As a rule, fruits have more of the soluble type while vegetables have more insoluble type of this nutrient. You should try to eat 25–30 grams each day. That should include at least 5–10 grams daily of the soluble types. There are two main types: soluble (also called viscous) and insoluble. While both have health benefits, only the soluble reduces the risk of heart disease. The difference between these two types is how they go through the digestive track. The soluble ones mix with liquid and binds to fatty substances to help remove them from the body. Thus they help to lower cholesterol levels- thereby reducing the risk of heart disease. Good sources are whole oats, barley, fruits, vegetables, and legumes (that is beans, peas, and lentils). Insoluble ones go through the digestive tract largely undissolved. Also called “roughage,” it helps the colon function properly. The recommended intake for adults 50 years and younger is 25 grams per day for women and 38 grams for men. Due to decreased food consumption in people over 50 years, women should take 21 grams while men ought to consume 30 grams of fiber per day. 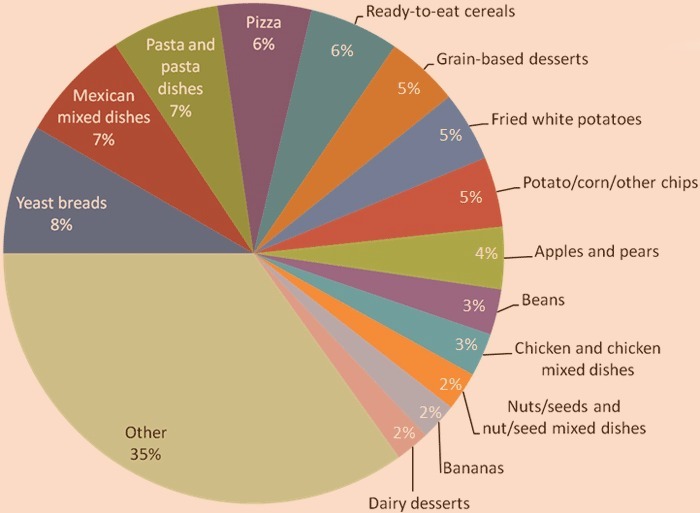 Most people in the United States eat only 15 grams per day, thus putting themselves at an increased risk for related diseases. A person can increase his/her intake by eating more fruits, vegetables, legumes, whole grains and whole-grain cereals. Research studies provide evidence that increasing your intake to 30 grams per day leads to a significant reduction on heart attacks, cancer of the colon, breast cancer, diabetes and diverticulitis. To obtain your daily intake, eat at least five daily servings of fruits and vegetables and three servings of whole-grain foods (whole grain bread, cereal and rice). High fiber foods require more chewing which slows down the eating process. When the eating process is slowed down, this gives you the feeling of being full, and this in turn helps prevent overeating and excessive weight gain. This nutrient makes food more satisfying, probably because the contents of the stomach are bulkier and food stays there longer. It slows digestion and absorption so that the glucose in food enters the bloodstream more slowly, which keeps blood sugar on a more even level. It is broken down in the colon (the main part of the large intestine) by bacteria (a process called fermentation), and this helps to nourish the lining of the colon. This nutrient is found in plant foods like fruits, vegetables, and grains. Add sliced fresh fruit to cereal, yogurt, or cottage cheese. Use whole grain breads (which contain at least 3 grams of fibre per serving) in place of white bread. Use more beans and peas in meals. Try split pea or lentil soup, brown rice and beans, or chili. Choose high-fibre cereals (5 grams or more per serving) for breakfast in place of refined, sugary cereals. Eat potatoes with the skin. When you cook vegetables, steam or stir fry until they are tender but still crisp. Use sunflower seeds, sesame seeds, or wheat germ for toppings on casseroles, or add them to baked goods like quick breads and cookies. Fiber is important in the diet because it decreases the risk for cardiovascular disease and cancer. Increased intake of foods with fiber also may lower the risk of coronary heart disease, because saturated fats often take the place of fiber in the diet hence increasing the absorption and formation of cholesterol. Other health disorders tied to lack of high fiber foods are constipation, diverticulitis, hemorrhoids, gallbladder disease and obesity.